RYAN: It’s the latest in the X-Men franchise which, if we’re paying attention, has been a bit all over the map – with prequels and spinoffs, etc. It all clicks in this movie though. This was just as good as the last one in terms of innovation and cool factor. I love the villain in this one – I didn’t even realize it was Oscar Isaac, whom I love. The effects are fantastic. And I’m glad to be joined in this review by my pal Kevin Gadzalinski, who is a big fan of these comics and characters. What did you think? KEVIN: I loved it. It relates to the comic books and my favorite X-Men is Cyclops and he had a leadership role in this one. He guides the new kids and the references to the other movies were fun – plus good humor. RYAN: Lots of jokes and Bryan Singer returns to direct. KEVIN: He did the last one, and X-Men 1 and 2. And he had a hand in First Class as a writer. RYAN: He’s the glue. Michael Fassbender, James McAvoy and Jennifer Lawrence get top billing and are all great. We don’t have to compare this to other superhero films but this is coming soon after Batman v Superman and Captain America: Civil War. Those were well balanced with different characters where as this one shortchanged a few of them. Olivia Munn as Psylocke. KEVIN: Archangel had a bit part and Storm, also. RYAN: How did Apocalypse compare in this to the comic books? KEVIN: It’s very close, actually. The look is similar. But he was merged a bit with another villain in the X-Men universe called Shadow King. RYAN: Interesting. It’s always fun to ask people what superhero power they would choose and X-Men really each have only one power. When they come together as a team, they are more powerful. One of my faves is Quicksilver who is played by Evan Peters and I like his portrayal more than Aaron Taylor Johnson’s version in the last Avengers movie. KEVIN: Yeah he’s more lighthearted here. He has some of the best action scene and effect scenes too. RYAN: How do you like this compared to Spider-man? You’re a big Spidey fan. KEVIN: He shares the universe with X-Men in the comics but that probably won’t happen in the movies. But these movies are more in depth and seem to have more going on that is reminiscent of the comics. Spider-Man is usually kept lighter and this film was dark. RYAN: Surprisingly dark. It’s PG-13. There was actual red blood which you don’t usually see in PG-13 and they even said the F word here. 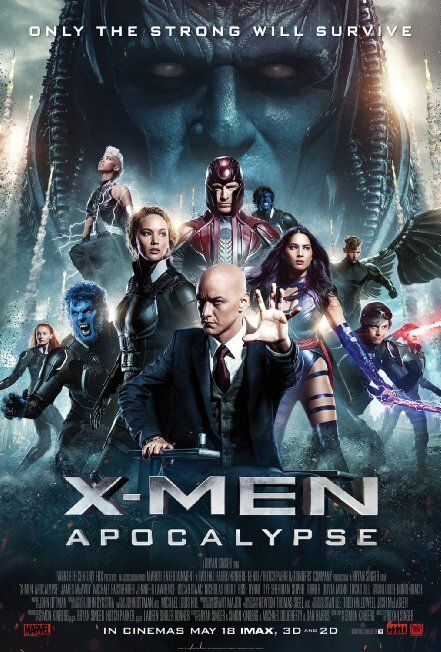 It almost could have been rated R.
KEVIN: It’s the most graphic X-Men so far. RYAN: The opening sequence of the film is phenomenal. KEVIN: It was a cool way to introduce Apocalypse and the four horsemen. RYAN: The 3D is good and it takes you through the ages, from biblical to modern times. KEVIN: Their title sequences have always been very good. RYAN: Quicksilver has some more, cool slow-mo effects that I loved so much in the last one. KEVIN: I liked Jean Gray in this one too. She is showcased a bit more. RYAN: One thing that separates this from the DC and Disney Marvel movies is there are lesser-known actors in these at times. They bring a freshness and unpredictability to this. KEVIN: I liked Nightcrawler in this too. RYAN: J Law is good but is Mystique too big because of the actress? KEVIN: Yeah she is important but they do use her more than most. KEVIN: She’s also a bit of a leader in this one. She’s someone who sways between good and evil but she’s been more good lately. I’ve seen all the TV cartoons and everything and she’s usually a villain so it’s cool seeing this side of her too. I liked the end very much. There’s some great visual design nods to the comics. I think it’s a must see. It expands the franchise nicely. RYAN: I liked it. It’s a great next chapter – and the Hugh Jackman’s cameo made be fangirl out for a moment. It’s a little long and slower in parts; but just amazing action with great effects and 3D.